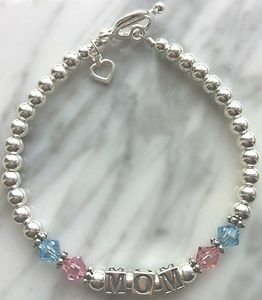 Swarovski "Mom" Bracelet Specifics: This design features smooth round silver beads, Swarovski crystal beads and a dangling Heart charm and silver letter blocks that spell out "MOM". This bracelet is made from .925 sterling silver right down to the wire and jump ring. It has 5mm sterling silver balls, 6mm sterling silver spacers, 5.6mm sterling silver letter blocks and 6mm genuine bicone Swarovski crystals. Mom bracelet can be custom made with your own color crystals for corresponding birthstones at no additional charge. Add the information for the colors you want in the comment section at the end of the checkout page.